The RMI Architecture is very simple involving a client program, a server program, a stub and skeleton. In RMI, the client and server do not communicate directly; instead communicates through stub and skeleton (a special concept of RMI and this is how designers achieved distributed computing in Java). They are nothing but special programs generated by RMI compiler. They can be treated as proxies for the client and server. Stub program resides on client side and skeleton program resides on server. That is, the client sends a method call with appropriate parameters to stub. The stub in turn calls the skeleton on the server. The skeleton passes the stub request to the server to execute the remote method. The return value of the method is sent to the skeleton by the server. The skeleton, as you expect, sends back to the stub. Finally the return value reaches client through stub. Note: The method existing on the server is a remote method to the client (because client and server may be far away anywhere in the globe); but for the server, it is local method only. So, for the client, the server is remote server (okay, in server point of view, the client is remote client, but in RMI, we do not call client as remote client), a program on the remote server is remote program and finally the method in the remote program is remote method. Know the meaning of remote server, remote program, remote method; this must be very clear to the beginner else the RMI concept is very confusing at the outset. So, anything residing on server is remote to client. The RMI Architecture process is explained figuratively as under. 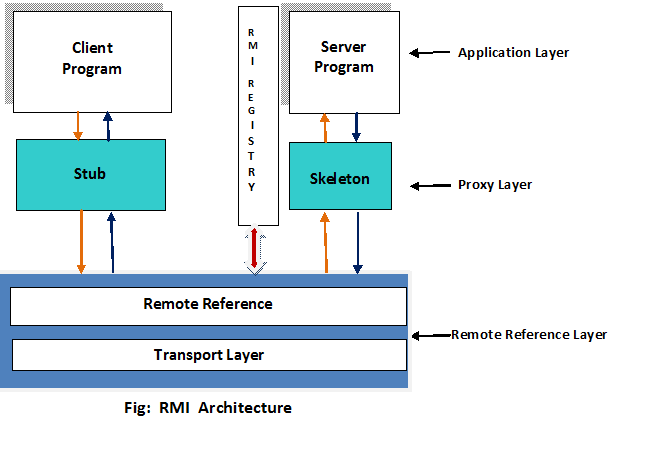 As the figure illustrates, there comes three layers in the RMI Architecture – Application layer, Proxy layer and Remote reference layer (Transport layer is part of Remote reference layer). This layer is nothing but the actual systems (client and server) involved in communication. A client Java program communicates with the other Java program on the server side. RMI is nothing but a communication between two JVMs placed on different systems. The proxy layer consists of proxies (named as stub and skeleton by designers) for client and server. Stub is client side proxy and Skeleton is server side proxy. Stub and skeleton, as many people confuse, are not separate systems but they are after all programs placed on client and server. The stub and skeleton are not hard coded by the Programmer but they are generated by RMI compiler (this is shown in execution part later). Stub is placed on client side and skeleton is placed on server side. The client server communication goes through these proxies. Client sends its request of method invocation (to be executed on remote server) to stub. Stub inturn sends the request to skeleton. Skeleton passes the request to the server program. Server executes the method and sends the return value to the skeleton (to route to client). Skeleton sends to stub and stub to client program. One more job of proxies is marshaling and unmarshaling. Marshaling is nothing but converting data into a special format suitable to pass through the distributed environment without loosing object persistence. For this reason, the RMI mechanism implicitly serialize the objects involved in communication. The stub marshals the data of client and then sends to the skeleton. As the format is not understood by the server program, it is unmarshaled by the skeleton into the original format and passed to server. Similarly from server to client also. A marshal stream includes a stream of objects that are used to transport parameters, exceptions, and errors needed for these streams for communicating with each other. Marshaling and unmarshaling are done by the RMI runtime mechanism implicitly without any programmers extra coding. Proxies are implicitly connected to RMI mechanism through Remote reference layer, the layer responsible for object communication and transfer of objects between client and server. It is responsible for dealing with semantics of remote invocations and implementation – specific tasks with remote objects. In this layer, actual implementation of communication protocols is handled. Transport layer does not exist separately but is a part of Remote reference layer. Transport layer is responsible for actually setting up connections and handling the transport of data from one machine to another. It can be modified to handle encrypted streams, compression algorithms and a number of other security/performance related enhancements. The marshaled stream is passed to RRL(Remote Reference Layer). Task of RRL is to identify the host, that is, remote machine. The marshaled stream is passed to Transport layer which performs routing.